Brendon D. Gregg, who is a computer performance analyst, has created Flame Graphs to visualize stack traces in an interactive way. You must watch his talk at USENIX/LISA13, titled Blazing Performance with Flame Graphs, which explains Flame Graphs in detail. There can be different types of flame graphs and I'm focusing on CPU Flame Graphs with Java in this blog post. Please look at the Flame Graphs Description to understand the Flame Graph visualization. As Brendon mentioned in his talk, understanding why CPUs are busy is very important when analyzing performance. CPU Flame Graphs is a good way to identify hot methods from sampled stack traces. In order to generate CPU Flame Graphs for Java Stack Traces, we need a way to get sample stack traces. Brendon has given examples to use jstack and Google's lightweight-java-profiler. Please refer to his perl program on generating CPU Flame Graphs from jstack and his Java Flame Graphs blog post on using the lightweight-java-profiler. While trying out these examples, I was thinking whether we can generate a CPU Flame Graph from a Java Flight Recording Dump. Hot Methods and Call Tree tabs in Java Mission Control are there to get an understanding of "hot spots" in your code. But I was really interested to see a Flame Graph visualization by reading the JFR dump. In this way, you can quickly see "hot spots" by using the Flame Graph software. Note: JFR's method profiler is sampling based. In order to get sample stack traces, I needed a way to read a JFR dump (The JFR dump is a binary file). I found a way to parse JFR dump file and output all data into an XML file. Even though, this is an easy way, it takes more time and the resulting XML file is quite large. For example, I parsed a JFR dump around 61MB and the XML was around 5.8GB! Then I found out about the Flight Recorder Parsers from Marcus Hirt's blog. There are two ways to parse a JFR file. Using the JMC Parser - This is available in Java Mission Control. For more info, see the Marcus' blog posts on Parsers. He has also given an example for Parsing Flight Recordings. As stated in his blog, these APIs are unsupported and there is a plan to release a proper Parsing API with JMC 6.0 and JDK 9. Converting JFR Method Profiling Samples to FlameGraph compatible format. I wrote a simple Java program to read a JFR file and convert all stack traces from "Method Profiling Samples" to FlameGraph compatible format. I used the JMC Parser in the program. I couldn't find a way to get Method Profiling Samples using the Reference Parser. I was only able to find the "vm/prof/execution_sample" events from the reference parser and there was no way to get the stack trace from that event. The JMC Parser was very easy to use and I was able to get the stack traces without much trouble. The code is available at https://github.com/chrishantha/jfr-flame-graph. Please refer the README file for complete instructions on building, running and generating a FlameGraph from a JFR dump. Following is the FlameGraph created from a sample JFR dump. I got the JFR dump by running a sample application, which consumes more CPU resources. Original source files were obtained from a StackOverflow answer, which explains a way to find a thread consuming high CPU resources. Please note that the package name and line numbers are different in the FlameGraph output when comparing with original source code in StackOverflow Answer. (I will try to share the complete source code later). This blog post explains a way to generate CPU Flame Graphs from a Java Flight Recording using a simple Java program. It's nice to see Srinath's tweet has so many retweets! Brendon has also mentioned about my program in his Flame Graphs page! Update (September 14, 2015): Java 8 Update 60 was released on August 18, 2015. There are some recent changes to "perf-map-agent". There is no longer a script named "perf-java" and you should use "bin/create-java-perf-map.sh "
Brendan Gregg shared an exciting news in his Monitorama talk: The "JDK-8068945" is fixed in Java 8 Update 60 Build 19! Without this fix, it was not possible to see full stack in Java with Linux perf_events and standard JDK (without any patches). For more information, see Brendan's Java CPU Flame Graphs page. First of all, let's see what's the problem with using current latest Java and perf. For this example, I used the same program explained in my previous blog post regarding FlameGraphs. When we are trying to find performance issues, it is sometimes necessary to do continuous recordings with Java Flight Recorder. Usually we debug issues in an environment similar to a production setup. 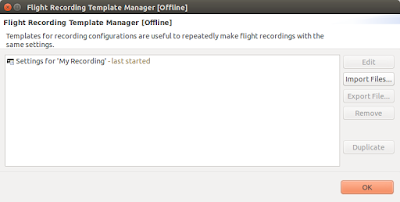 That means we don't have a desktop environment and we cannot use Java Mission Control for flight recording. That also means we need to record & get dumps using command line in servers. We can of course use remote connection methods, but it's more easier to get recordings from the server. With continuous recordings, we need to figure out how to get dumps. There are few options. Get a dump when the Java application exits. For this, we need to use dumponexit and dumponexitpath options.Get a dump manually from JFR.dump diagnostic command via "jcmd" Note: The "jcmd" command is in $JAVA_HOME/bin. If you use the Oracle Java Installation script for Ubuntu, you can directly use "jcmd" without including $JAVA_HOME/bin in $PATH.